← Page 202 – I object! When he said he liked the name Sam, HE WASN’T KIDDING. I donated at a level to be a background character, and sent pictures of myself shortly after you emailed me to do so in July, but I have not located myself in the last several pages. I don’t want to come off as whiney, as I was more than happy to help you with your wedding, but I was really looking forward to it and to showing people. I guess seeing my name in print will have to do. Are Sam and Max named after the Freelance Police? Nice story resolution. Only minor suggestion I’d make is that the scratchy lines on the ice queen in the last panel could have been softened a little, perhaps as solid shadow to suggest the shoulderbones, etc. Still, the art rocks. Just like George Foreman naming all his kids ‘George’. 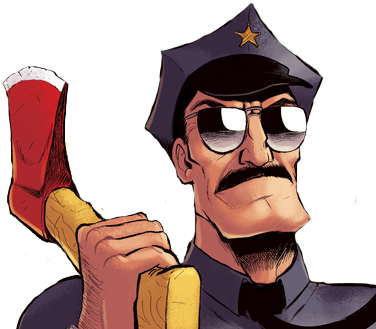 Didn’t Axe Cop also adopt Good Bunky? Heh, this is a very unexpected yet adorable ending. Yay for new Axe Cop episodes on FOX! Reading the comic is so much better (not that it wasn’t already awesome) now that I hear him in Nick Offerman’s voice in my head. My problem is I keep switching back and forth between Nick Offerman and Dave DeAndrea. max and sam, as in steve purcell’s sam’n max? This also means that they are not a unnamed race of aliens anymore, they are the “Sam”.